Sweet, savory, and easy to prepare. 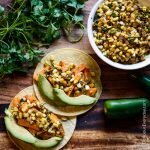 These sweet potato tacos are loaded with flavor and topped with Mexican street corn. And completely vegetarian! Toss sweet potatoes in light coating of olive oil. Sprinkle with salt and pepper. Spread in a single layer on baking sheet. Bake for 30 minutes, or until softened and just beginning to caramelize. Meanwhile, heat drizzle of olive oil in large non-stick pan, over medium heat. Add onion, and cook for 3-4 minutes, until softened and slightly browned. Add garlic and cook for 1 more minute. Add corn. Stir, and spread into a single layer. Cook - without stirring - for 5 minutes or until browned on underside. Stir, spread into single layer again, and cook for additional 3 minutes. Add 1 tbsp olive oil, 1 cup cotija cheese, chili powder, lime juice, and cilantro. Add salt and pepper to taste. Mix well. Remove from heat, and set aside the Mexican Street Corn. Warm tortillas on a baking sheet in the oven for 3-5 minutes. Assemble the sweet potato tacos! Top each corn tortilla with a layer of roasted sweet potatoes, a scoop of Mexican Street Corn, and several slices of fresh avocado. Top with a sprinkle of cotija cheese. Serve.